A Pale echo of The Berwick Cross. The difference is in the medium and the colour. This unique piece is made of solid polyurethane resin. It has been patinated with acrylic paint and gold size oil varnish. Unwaxed. Bases are wood, blackboard paint, waxed. I was commissioned by Berwick Church to design a crucifix to replace one which had been stolen. The idea developed into a portrayal of Jesus’s resurrection rather than his suffering, but which would echo the shape of the cross. Having grown up in a devout Christian family and society, this became a fascinating opportunity to explore that inheritance, to reassess beliefs and attitudes, to search for something genuine and truthful for myself and to try to make it believable and relevant to others. Originally planned as a wood carving, the present version in bronze has taken a year of working in clay and then wax, a process of discovering the shapes and tensions of expression and of finding a way to describe aliveness, recognising that the cross must serve as a focal point above the altar and contribute to the beliefs and well being of the church. energy into his hands from which all love and power emanate. With his caring arms outspread he offers blessing as he reveals true stillness, the way to inner light. A sculpture is a way of encountering ideas. This developed through an attitude of meditation, working on it at the same time every day. Making an entirely abstract or primitive simplification of the icon of Jesus on the cross would I feel have missed out on the rich past of Christian imagery and the multitude of expressions of his wisdom and influence that are the history of this wonderful old church, and although the cross is set in a context of art, it should firstly serve those who come here for peace, prayer or worship. 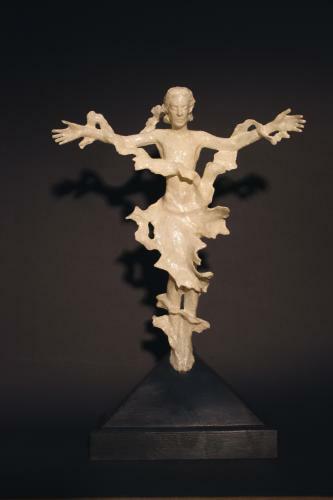 It was a very gradual process of contemplating the myriad thoughts and feelings that came up through the sculpture materials, exploring possibilities, refining necessities and searching for poise until a vision began to emerge that held it all together, this expression of gentle resurrection, of stillness, of Jesus appearing to us in luminous human form. Berwick Church is very near Charleston Farmhouse, the home of the Bloomsbury Group, in the chalk hills of the South Downs, between Eastbourne and Lewes. Two of their members, Vanessa Bell and Duncan Grant, painted murals of religious scenes to cover the interior of the church during WWII, and many of Charleston’s visitors go on to visit the church. Charleston Farmhouse are celebrating a centenary of the group this year, and their season starts on 23rd March. It’s appropriate that the church has commissioned a new piece of art for this year. As well, this new crucifix, that is designed as an image of the Resurrection, is being installed in time for Easter. The cross is a record of this meditation, a piece of art about oneness, offered as a devotional object.